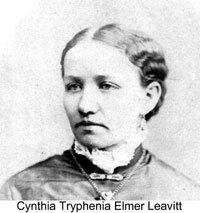 Grandmother Leavitt was born at Bingham's Fort, Ogden, Utah on december 16, 1852 to William Elmer and Hannah P. Child Elmer. She told my sister and me this story when she was living in her old house in North Garland, Utah, a number of years after Grandfather Leavitt's death. "When we first settled in the fort there were many sacrifices to be made, many hours were spent walking along the fences pulling the wool from them. Sometimes, by hard work, I was able to get three bags in a days time." "This my mother would wash, then card, leaving it for me to spin. After this was done, we would weave it into cloth, with which we could then fashion ourselves dresses." She said, "You can be sure I was always proud when I had a new dress." "Our wash days were very complicated. we placed a large kettle, which we shared with all within the fort, near an open fire. A stove was an unknown luxury." "We washed our clothes by hand, and ironed them with heavy irons. These were kept hot on large bricks which were heated in the fire for hours." In the fort we were often down to just one kind of food, many times we would make weary trips to our neighbors in order to exchange food with each other. We exchanged wheat, corn, or perhaps give a little sugar for a piece of butter. When we were fortunate, we were having a feast." "We were always in danger of Indian attack. We would get a warning to keep quiet and we always obeyed the orders. Many times my parents, brothers, and sisters would kneel and pray for safety. A large fire on the horizon was terrifying to us, as we knew it meant Indians and trouble." "As I grew older, I became intersted in the use of medicine, and as time went on you can be sure that there was a need for what I had learned. I waited and served at the bedside of many of the women of our fort and helped usher into the world many little new-born babies." I married John Q. Leavitt on August 16, 1869. The Lord blessed us with five children of our own, two sons and three daughters, and to the best of my ability I raised three of John's children and an orphan boy "grandpa" had brought home right off the streets of Salt Lake City." Grandmother told us that this boy called Fritz, had had head lice, due, probably, to neglect. They kept him to himself until he was cleansed free of them. Then he was brought right into the family with the other children. This man grew up to be a good family man and visited them often. Grandmother told us that Grandfather Leavitt taught school for a while when he first arrived in Ogden. She said that she was one of his pupils for a short time. I remember Grandmother Leavitt well, perhaps because I was named after her, my first given name being Cynthia. I remember how Grandmother always applied a soft, warm cloth to our cuts and bruises. Accompanying this was her loving soft words and very gentle voice. She was patient, kind, self-sacrificing, good to all who knew her and loved by all. I remember as a child that no rocking chair ever was as soft and comforting to me as hers. Her big, high, and soft bed was so delightful to sleep in after her soft sincere prayers were said for the good of us all. My grandmother was sickly for about two years before she passed away on the morning of December 7, 1934. She asked my mother and my Aunt, her sister Clara, for a shawl to be put around her shoulders. She then said, "Grandpa's come for me, I'll be going." With these words, she gently passed away.